I’ve been buying Vichy micellar cleanser for such a long time, that I decided to buy something else just for the sake of change. I don’t have whole lot to tell you about this cleansing water, but I did like it and wanted for you to maybe glance at it next time you’re buying new make up remover. Scent is almost nonexistent (something faintly chemical) which I love – perfume is really not wanted in my makeup remover products – I have enough problems with irritations as is. Is it better than Vichy one? If anything I would say both are good and I’m forever changing my mind which one is better. Difference is so minimal, I’ll go ahead and call them even. It does remove most of my make up, but then again I don’t really use waterproof products so I can’t tell you how it copes with those. I think Vichy micellar solution removes mascara tiny bit better, but I’m not really sure if it’s just different mascara or if that is true for majority of them. I use Bourjois micellar cleansing water the same way I use Vichy one – I discribed the steps in my makeup removing routine post. Packaging I don’t like. In all honesty I dislike all Bourjois skin care packaging with little ball on the top – it’s annoying and makes opening products harder. That is, until it breaks off and then you can have really difficult time even opening certain products. Price is around 4 EUR for 250ml I think, so not to expensive for something that worked on me. What are your experiences with this micellar solution and which one is your favorite? Have you tried Ideal Soft by L’Oreal? In my opinion it’s better than the Bourjois one and comparable to the famous Bioderma or Vichy, which I also like. 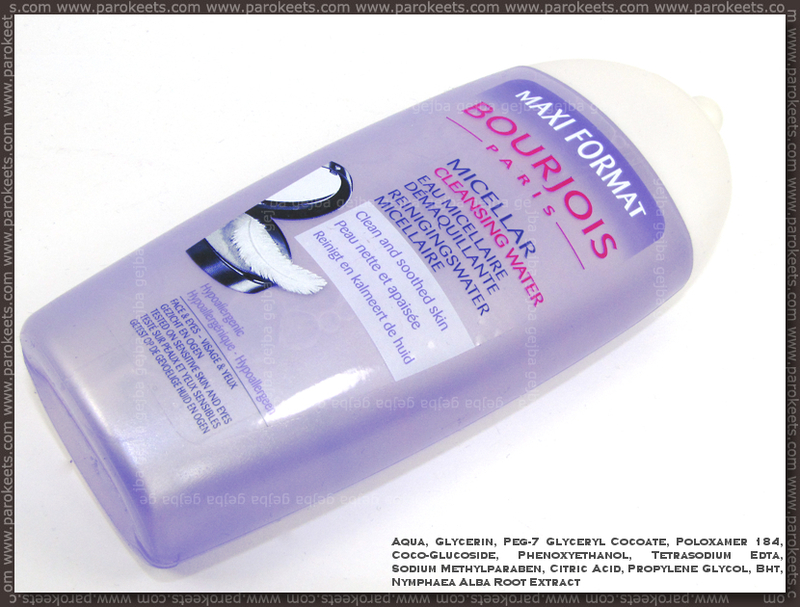 The ingredient list is shorter than in case of Bourjois (AQUA, HEXYLENE GLYCOL, GLYCERIN, POLOXAMER 184, DISODIUM COCOAMPHODIACETATE, DISODIUM EDTA, POLYAMINOPROPYL BIGUANIDE) – no BHT and phenoxyethanol. Zaenkrat sem preizkusila samo Biodermino, katere cena je kar visoka. Ravno zaradi visoke cene jo uporabljam predvsem za odstranjevanje očesnega makepua (tam imam zelo občutljivo kožo), vendar se moram kar potrudit da odstranim liner in maskaro (pa ne uporabljam vodoodporne). No, priznam da 15 sec jo nikoli ne držim, zato moram iti kar dostikrat čez (še posebno če je kak obstojen liner se je treba potrudit da odstrani pri liniji trepalnic…). Uporabljam jo predvsem zato ker skoraj po vseh odstranjevalcih dobim lišaje na vekah pri tej pa nimam nobene alergijske reakcije. Tebi brez težav odstrani liner in maskaro?